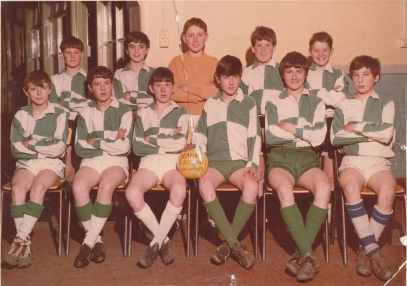 St Joseph's Under 14's 1967/8. Back Row L - R. Maurice Carroll (Mog), Pompey Lamb, Bernie Giblin, Kevin Finan, Paul Mather. Front Row L - R. Tommy Simpson, Jimmy Vickers, Frank Duffy, Robert Lowery (Shirty), George Golden and Mickey Grogan. Submitted by: George Golden, Wantirna , Victoria, Australia.